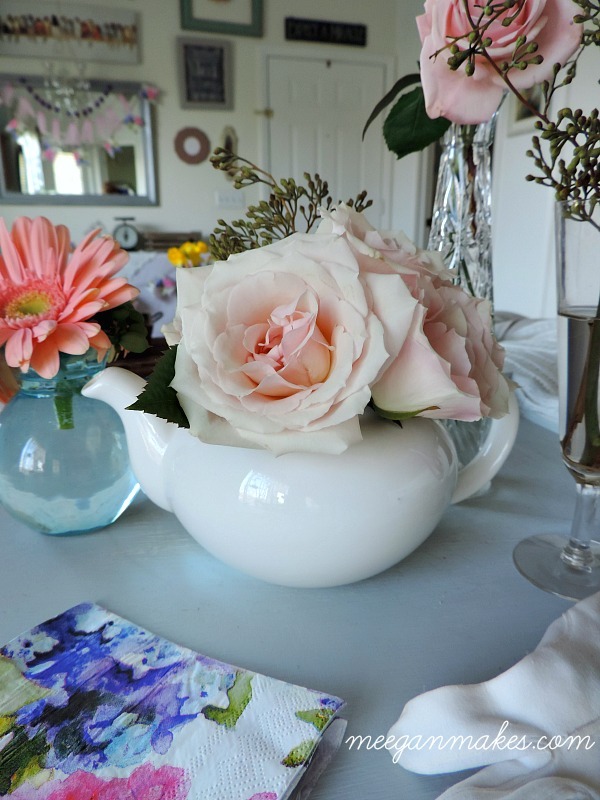 has been fast at work to create thrifty ideas and decor for your home and life. This is an easy way to add some color in your home with minimal cost and very little effort. 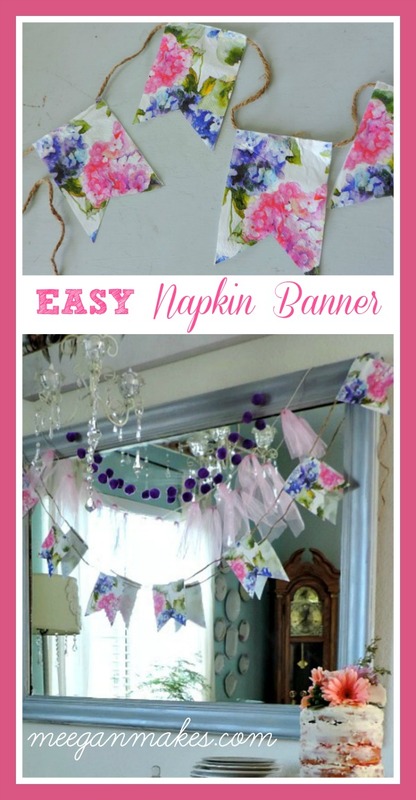 Making a Thrifty Napkin Banner will bring a whole new look to your parties, family time and holidays. 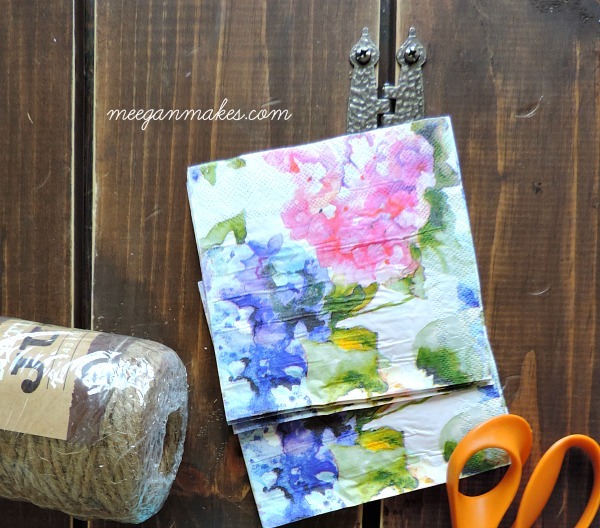 Let’s get started and make your own Thrifty Napkin Banner. I was able to get four banner pieces from each napkin. I cut the banner pieces 4 inches wide, and then cut a triangle at the bottom. I wasn’t too worried about them being “PERFECT”. Although, I was careful not to leave jagged edges. 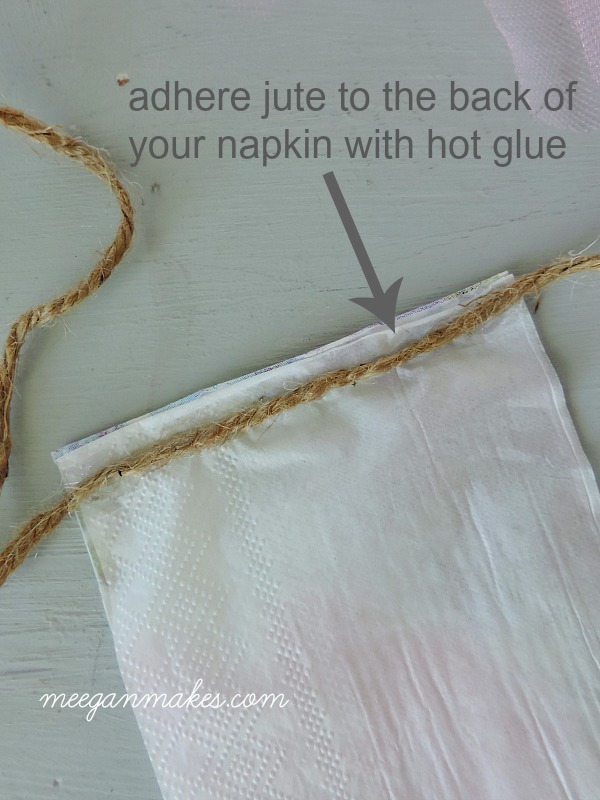 Now it was time to adhere the napkin to the jute. I spaced my banner pieces about 3-4 inches apart. But again, I didn’t make it perfect. I like a little bit of variety. BUT, I did eyeball it, so it looked evenly spaced. 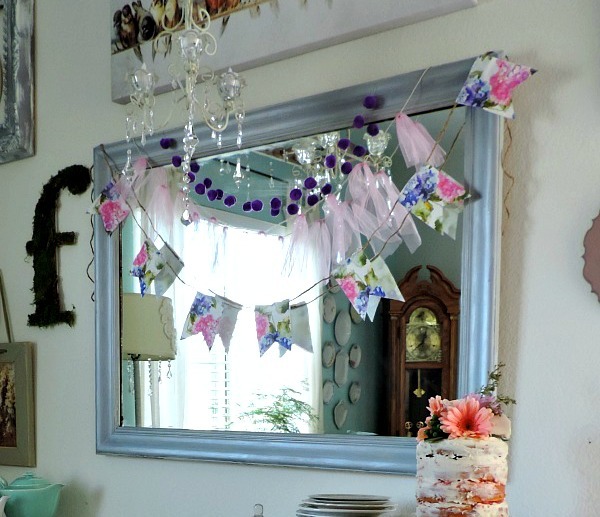 You can see how fun the Napkin Banner looks with my tulle banner and the pom pom string I made at Halloween. I will have a tutorial for the tulle banner next week. So stay tuned. 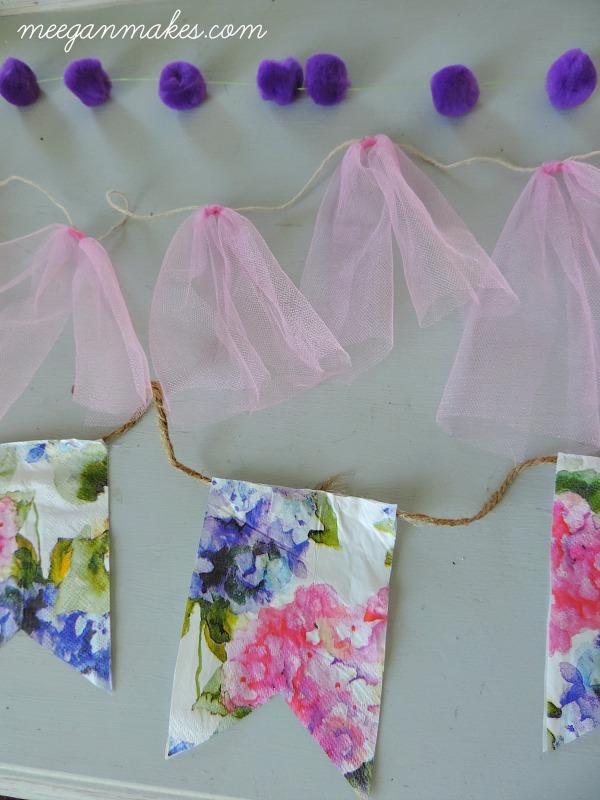 I think a Thrifty Napkin Banner would look so pretty as a Spring/Easter decoration. What about Fourth of July, Memorial day, Veteran’s Day, Flag day with flag print, or red, white and blue napkins? Even as an accent on a Christmas tree or on a patio for Summer decor. Use your imagination and run with it. 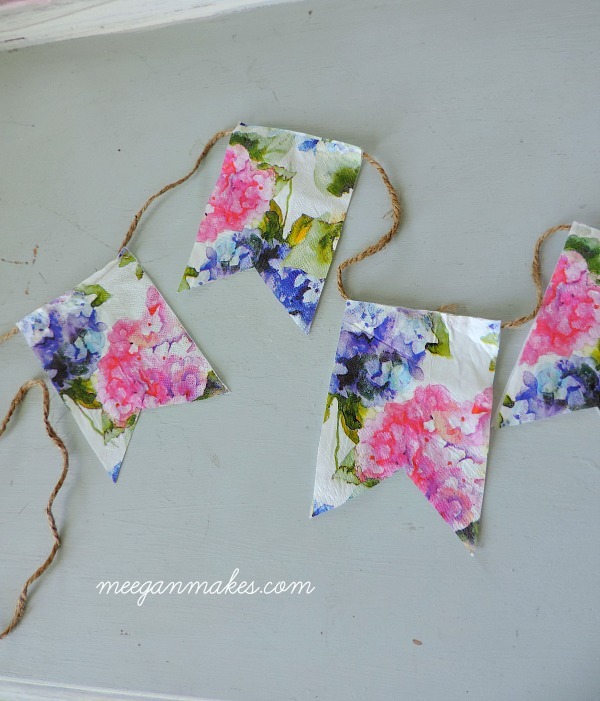 Do you think you will make a Thrifty Napkin Banner? Thanks for stopping by today. It is always fun to have you here. Be sure to visit my talented friends for THEIR thrifty ideas. Meegan, this is not only adorable, but so affordable! Love it. Your banner is super cute! 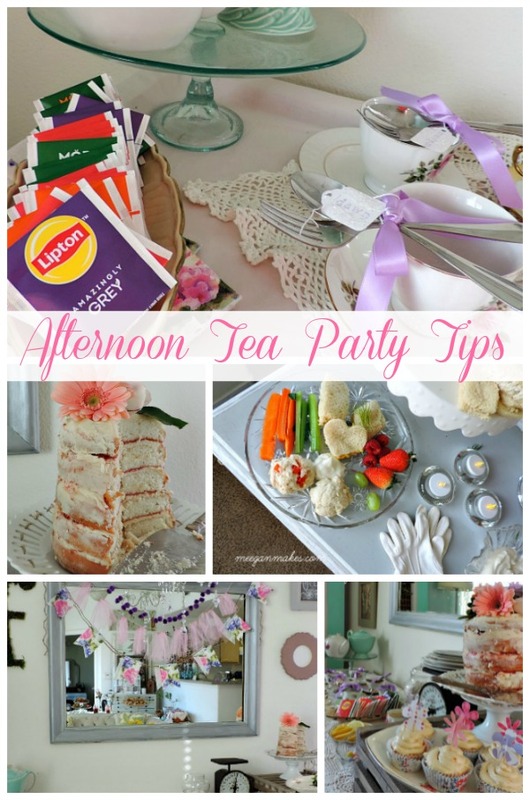 We can think of so many ways to use this idea for future parties and get-togethers in our homes. Thanks for sharing such a great idea! You are way to smart! I’m going to have to look at napkins a whole new way now because that looks really cute. What a fun idea Meegan! You chose such a pretty napkin for this project too. This turned out so pretty, Meegan! 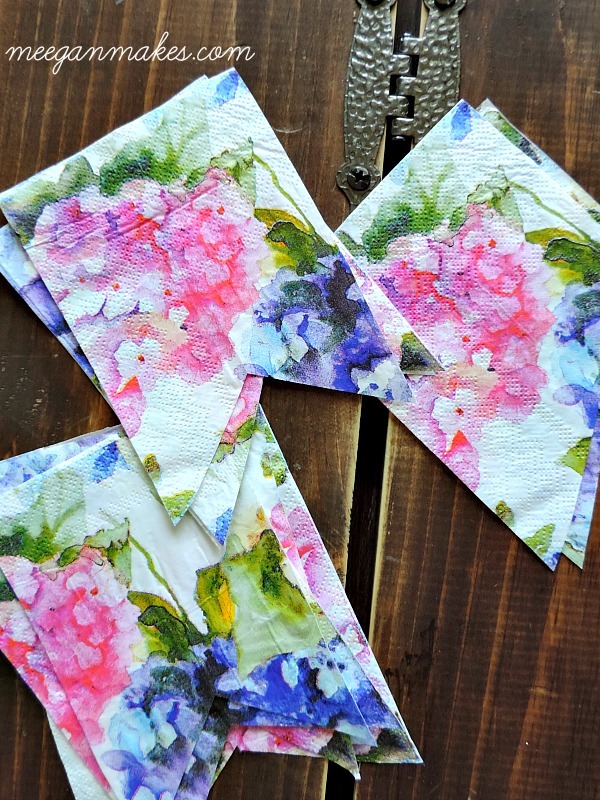 I just grabbed some fun , floral napkins at Homegoods recently…now I know what to do with them. So smart! 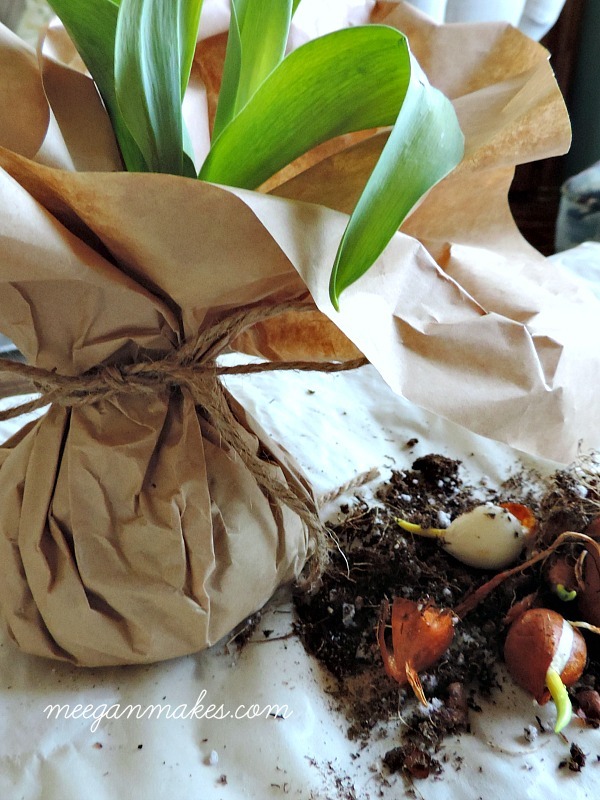 using cocktail napkins is such a clever idea…and so cute and easy. thanks for sharing this idea. I love this idea!! I have the coolest napkins from IKEA. I can’t wait to try it! Your banner is so cute and I will never look at cocktail napkins in the same way again. Can’t wait to dig around in my napkin drawer to see what I already have! So cute and I loved that you used napkins. I always have pretty napkins tucked away. I’ll have to pull them out and give this a try. Thanks so much for sharing! This is so pretty! Your creativity always inspires me.